Industrial contamination left the site of this garden unsuitable for growing food, but the fact that it had been concreted over in the 1950s made it a perfect demo site for Sow and Grow Everywhere, a project based around movable raised beds in grow bags. Four years from its initiation, the garden includes a ‘mobile orchard’, with fruit trees grown in wheeled barrels, and a chicken coop built from an old shed for five ex-battery hens. Workshops and cookery courses attract new faces, with after-school clubs for primary children among other activities taking place. In the grounds of Belhaven Hospital, this was one of the first community gardens of its type. The NHS has donated the land to community group Sustaining Dunbar for at least five years; it pays for some plants and materials and sits on the working group, but otherwise the garden’s members have free rein. Even so, development is approached very sensitively: the first area to be completed was a sensory garden for hospital patients and staff, and the whole garden is designed for wheelchair accessibility. The hospital’s day room overlooks a large orchard of fruit and nut trees, planted in 2012 to border land that was previously dog-walking scrubland. A polytunnel went up in 2013 and hosts workshops as well as plants, and there are eight raised beds, with another eight planned. At the time of writing, St Fittick’s Garden is simply nine empty raised beds, yet it is a powerful example of the ripple effect that food and gardening can have in creating change. Constructed by the ex-offenders of the Roots & Shoots programme, until 2012 the garden was an council yard. Roots & Shoots is a partnership programme lead by the charity Aberdeen Forward that aims to give participants skills and employment opportunities over a six-month unpaid placement. Gardening is just one aspect of the programme, which also teaches construction, first aid, logistics, cooking and a whole range of other skills. Basic horticultural training starts at the prison garden, where pupils learn to grow fruit and vegetables. Training continues on release, working on projects such as St Fittick’s Garden: when finished the plots will be adopted by local community groups and schools. Having demolished the buildings at St Fittick’s, cleared and levelled the six-acre site and planted 140 trees, they’ll start one of the beds off to show newcomers what can be grown, using seeds donated by the Fife Diet’s Seed Truck. Around 25 participants have come through the course so far: several have found full time employment, and more have gone on to further training. 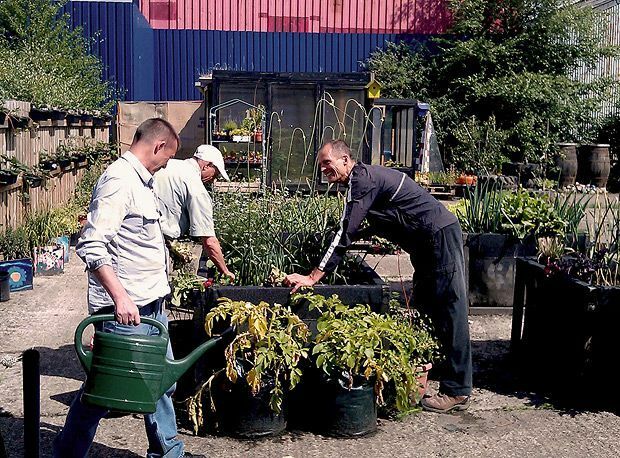 Part of Scotland’s only city farm, the well-established community gardens at Gorgie include wildlife, education, sensory and vegetable gardens, several greenhouses and a polytunnel. The working farm has a mostly self-contained system: manure from the livestock is spread on the garden, and the crops are supplied to the farm’s café, as well as taken home by volunteers and sold to visitors from a stall to raise money for running costs. Volunteers at the regular gardening groups sign up for a period of time – sometimes years – but one-off events are held that anyone can attend. ‘We ran a ‘Fork to Fork’ project recently,’ says Garden Project Manager Tracy Cudworth, ‘where people came to the farm and went through the whole process from growing to harvest to cookery classes. 2014 will see the wildlife garden redeveloped, and the building of a keyhole garden – an African design intended to demonstrate different farming methods from around the world. Beehives have just been introduced to the farm, and the hope is to add a second colony to the renovated wildlife garden. An eight-acre walled garden built in the 1780s, a restoration project has been underway at Amisfield for some years. Some areas are used for vegetable growing, and anyone can volunteer throughout the garden. Anyone can come along and volunteer, visit or buy produce from this community garden, which has a children’s play area and picnic area with views of the loch. Allotments are available for rent, both outdoors and in polytunnels. A specially adapted plot is wheelchair accessible, and The Shieling Project is a communal area for those not keen on taking on a plot of their own. Giving adults with learning difficulties the opportunity to train and work producing vegetables and fruit: read The List’s feature on Bringing HOPE to Angus: Hospitalfield's organic garden. A community garden for anyone to come along to and grow their own food, with a community polytunnel, summerhouse and all tools provided. Another NHS garden, run by The Cyrenians, in the grounds of the Royal Edinburgh Hospital in Morningside. Find more gardens at the Federation of City Farms & Community Gardens’ website.